Arwen: Why do you fear the past? You are Isildur‘s heir, not Isildur himself. You are not bound to his fate. Aragorn: The same blood flows in my veins. The same weakness. Arwen: Your time will come. You will face the same evil, and you will defeat it. 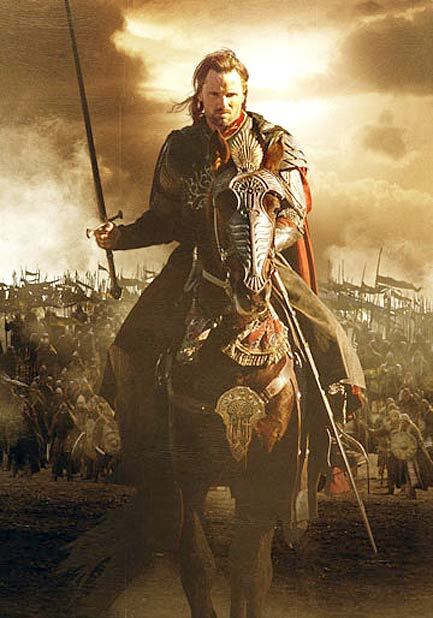 I didn’t initially set out to find an image of Aragorn to use as gravatar of A Warrior’s Journey – I first had mind to the indomitable figure of Spartacus so ably portrayed by the excellent and able-bodied Andy Whitfield of Blood and Sand fame, a series which very much emboldened and swelled the passions within. However, I could find none so compelling and sovereign and vivid as the above of Isildur’s heir riding to battle, none so apt. Here the sky lours behind him, his world is on fire, but he has conquered his doubts and is set to his task, it matters little he faces conquest and death, in his Warrior Power he is unflinching and vital and ready for all. Bereft of our Warrior Power we may submit to a world we do not much like, no matter how much we may seem to protest and struggle. Aragorn inspires hope. Having taken up his sword, Anduril, Flame of the West, he is assuming his power: steel in his heart and steel in his hand, he’s ready to cut down all that stands in his way. He no longer doubts his claim to the throne. He has made a decision. The babe that takes its first strides in the world. The will to lose weight and transform ones shape. The marathon run for a charity cause. The meditator who cuts through the noise of the mind. A Warrior’s Journey need not be one of conflict and war. Rather it is the simple assumption of our power to determine our lives as we see fit, the courage to follow our hearts. Like your statement “A Warrior’s Journey need not be one of conflict and war. Rather it is the simple assumption of our power to determine our lives as we see fit, the courage to follow our hearts.” So true! We have the opportunity to be warriors every day. Thanks for the comment Matt, I think we’re all warriors in our own way, some just harness that inner power more than others; but for my part the martial arts are definitely of massive benefit for bringing it in, and integrating it into our lives for use it in constructive ways.